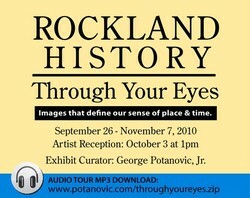 'Rockland History: Through Your Eyes'. in the HSRC's William Hand Gallery. We asked 39 artists for images that define their sense of place and time in Rockland County history. This is some of what they had to say. guests brought their CD player with headphones and borrowed an audio tour CD from the front desk. Jeanie Neyer - Danielle O’Brien - George Potanovic, Jr. This exhibition ran through Sunday, November 7, 2010. No museum entry fee except when otherwise noted. Donations were greatly appreciated. During exhibitions, the HSRC is open to the public Wednesday - Sunday, noon to 4 pm. HSRC Administrative offices are open Tuesday - Friday, 10 am - 5 pm and are closed on Mondays. 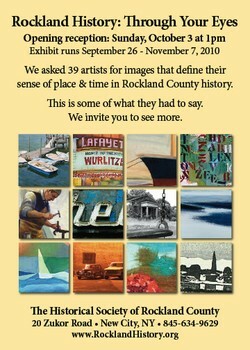 Research is by advance appointment only -- please e-mail: info@rocklandhistory.org with your query. Blauvelt House is by appointment for groups of 10+ -- please contact the HSRC for more information at: info@rocklandhistory.org .